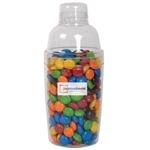 320 grams of milk chocolate M&M's packed in clear acrylic cocktail shaker with clear lid. M&M's available assorted colours only. Finished weight - 570 grams.